In honor of World Polio Day, which is widely recognized on Oct. 23, Ponca City Rotary Club is holding a special lunch meeting as part of Rotary’s 27-year mission to eradicate the crippling childhood disease polio. In celebration of World Polio Day, the Ponca City Rotary Club will be host a lunch event with a special guest speaker, local pediatrician Dr. Peter Sinton. 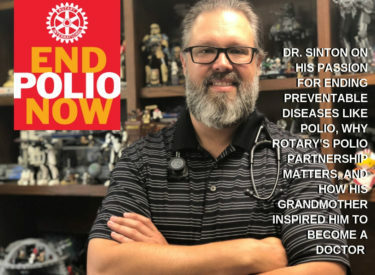 Sinton will speak on his passion for ending preventable diseases like polio, why the Rotary-Polio partnership matters, and how his grandmother inspired him to practice medicine. Since 1985, Rotary has contributed nearly $1.2 billion and countless volunteer hours to the protection of more than two billion children in 122 countries. The disease remains endemic in three countries — Afghanistan, Nigeria and Pakistan — although other countries remain at risk for imported cases. A highly infectious disease, polio causes paralysis and is sometimes fatal. As there is no cure, the best protection is prevention. For as little as 60 cents’ US worth of vaccine, a child can be protected against this crippling disease for life. After an international investment of more than $9 billion US, and the successful engagement of more than 200 countries and 20 million volunteers, polio could be the first human disease of the 21st century to be eradicated.